No one will be harder on Owen Farrell than the man himself after Scotland’s stunning second-half comeback against England in the Six Nations, insists Saracens teammate Nick Isiekwe. The Red Rose raced into a 31-0 lead against their old rivals at Twickenham on Super Saturday before six unanswered tries for Scotland saw the visitors take the lead. But a late George Ford try saved England’s blushes as the Championship finale finished 38-38 – the highest draw in Test history – with Scotland retaining the Calcutta Cup as a result. Captain Farrell came in for criticism after being at fault for two of Scotland’s tries, while he was also lucky to avoid a yellow card, but Isiekwe expects his clubmate to bounce back stronger. “All I know is he’ll want to get better, he’ll want to improve like every other guy in the squad,” said Isiekwe, speaking on behalf of Land Rover. “Owen’s a great player and a great leader for us. “He’ll want to get better and it’s not a problem what other people think. It’s a tough one, he’ll do what he sees fit and he’ll play what he sees. He’ll make the right decisions. “He’s very good as a leader on the pitch, you know what you need to do from him, you know where you stand, you know the role and I can’t speak highly enough of him. “That’s one thing about him, he communicates very well, you know what you’re doing when you’re doing it and that’s a credit to him, he’s always caring about other people. Farrell saw his kick charged down by Stuart McInally for Scotland’s first try, while the 27-year-old also had a pass intercepted by opposite number Finn Russell, who scored his side’s fifth. England’s capitulation on Super Saturday concluded a rollercoaster Championship as Eddie Jones’ men finished in second place in the table behind Grand Slam winners Wales. But the Red Rose lost several key players during the Six Nations, including Maro Itoje, and while the players who replaced him performed well – Isiekwe hailed his Saracens teammate. “The boys that came in did a great job, but Maro is a great player, he is a great influence on the team - but the boys did a great job and it’s a credit to them,” he said. “They stepped up when they needed to do so, but Maro is a fantastic player and he’s a massive leader, he has a great amount of energy and aura around him. 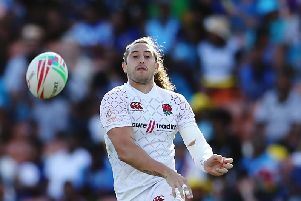 Isiekwe won his first caps for the Red Rose in 2017 after the 20-year-old was called up by Eddie Jones for the two-Test series in Argentina, before making a third appearance against South Africa last year. He was brought into the training squad for the Six Nations and admits the fire in his belly is burning stronger than ever to meet the standards Jones demands from his players. “It’s invaluable being around the England squad and seeing how they operate, it makes you push yourself and it shows you how you need to raise your standards in everyday training,” he said. Isiekwe was speaking as he and fellow Premiership Rugby players from Saracens and Harlequins were leading a coaching session on behalf of Land Rover at Beaconsfield RFC, putting London rivalries to one side, in aid of supporting grassroots rugby.